Home / US / Why did the boy's family who died in the Border Patrol prison decide to send him north? Why did the boy's family who died in the Border Patrol prison decide to send him north? The 8-year-old boy died on Christmas Eve and became the second Guatemalan child to die in US customs and border guards this month. "Take my son home," she told Univision on Thursday through a translator. "I have to see him." "They told us that they would do anything to get him back, but we just want them to hurry," Felipe's sister Maria said. Before Felipe's father made his journey north, according to the midwife who helped rescue the boy, the family struggled to make ends meet. So his parents decided Felipe should go along. "They agreed to take their son with them," midwife Maria Domingo Lopez said on Thursday to the Guatemalan newspaper Prensa Libre. "She saw the need for the father, because there are days when we do not eat, we can not find anything." And there were not many ways to make a living in the green hills of Huehuetenango, the locals said in the paper. "Families are looking for ways to progress, this father has gone with his son, he hopes for a better education of his son," said village official Lucas Perez. The boy was arrested on December 18 with his father at a location near the miles west of Paso Del Norte in El Paso, Texas, for illegal entry, according to a CBP timeline of the days before Felipe's death , On Monday, Felipe was taken to a hospital where he was diagnosed with the common cold, released with medication, and then returned to hospital. He died shortly before midnight at the Gerald Champion Regional Medical Center in Alamogordo, New Mexico, about 90 miles north of the border crossing in El Paso, Texas. "The poor child could not hold on," said Domingo Lopez, the midwife. The cause of death is unclear. An autopsy was scheduled for Wednesday in Albuquerque. 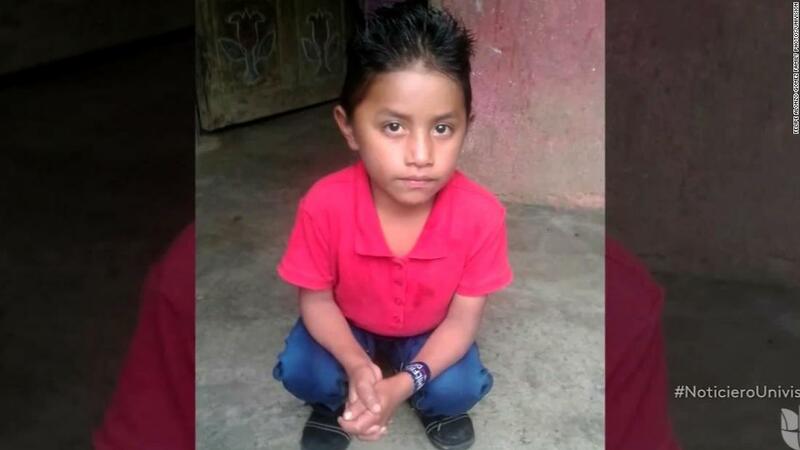 Felipe dies, just weeks after a 7-year-old Guatemalan girl detained by CBP gives rise to criticism of the federal agency's handling of a wave of migrant children at the southwestern border and to more medical examinations of minors. Minister of Homeland Security, Kirstjen Nielsen, called this week the death of a child in government "deeply disturbing and heartbreaking." She announced several policy changes regarding the government's care for migrant children and reiterated her call "to encourage parents not to endanger their children through a dangerous journey north". On December 8, 7-year-old Jakelin Caal Maquin died at a hospital two days after being taken to a border post. Her body was returned to the indigenous community of Guatemala in Raxruha last weekend. Her family said she fled the country with her father, Nery Gilberto Caal, 29, in search of a better life. She survived the 2000-mile journey from northern Guatemala and died less than 48 hours after Border Patrol agents detained her at a US-Mexico border crossing. Her death was another hot topic in the debate over the immigration strategy of Trump's government enforcement. Prior to this month, there were six deaths in CBP in 2018, and none of them were children, DHS officials said. Prior to Jakelin, no child died in CBP captivity in more than a decade, state security officials said. In the last two months alone, the Border Guard has arrested 139,817 undocumented migrants at the Southwest border, compared with 74,946 at the same time in the 2018 tax year (Nielsen).